CodeTwo Exchange Rules 2003 lets you define rules for adding footers both to external and internal messages. 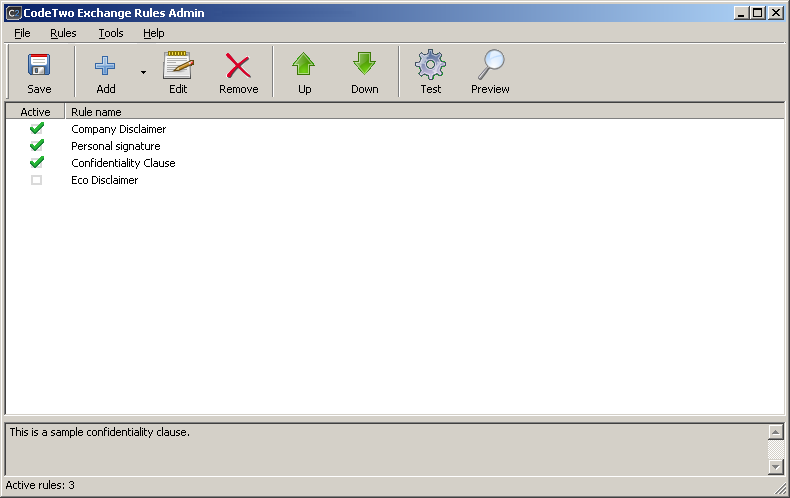 The role of the program is to find a matching rule for a sent message taking into account its sender and recipients. The order in which the program attempts to match rules is from the highest to the lowest rule as seen in the main program screen. When the program has found the first matching rule to a message, it will add a footer defined for this rule. If you want to change the order of rules, use Up and Down buttons in the main toolbar. A quick guide on how to create a new rule can be found in the chapter Creating A Rule Adding Footers – Quick Guide. When you create a new rule, choose its name that will be displayed in the program’s main screen. Optionally, you can provide a description of the rule in the rule wizard. This description of a rule is displayed in the field below the list of all rules when you highlight the rule. The rules are matched based on the sender and recipients’ addresses in a message. For a rule to be applied it must meet both the conditions specified in the senders’ scope and recipients’ scope. Both the senders and recipients’ scopes can contain the list of exceptions. For the rule not to apply, it is enough if the sender or recipient is included in the list of exceptions to the rule. The senders’ scope is specified by providing a set of conditions that must be met for a sender to be included in the senders’ scope. While providing data in the senders’ scope, you can use full or partial SMTP addresses of senders, as well as objects from Active Directory database, e.g. organizational unit, group, user, or specific value in a selected field in Active Directory Object’s properties. Specifying the scope of recipients for whom the rule must apply is done similarly to the senders' scope, you can use full or partial SMTP addresses of recipients, as well as add Active Directory objects. In addition, when specyfing the recipients' scope, you can choose in a single click the external recipients or internal recipients. A useful element that you can use while specifying the senders and recipients is the wildcard or asterisk (*) sign. It replaces any sequence of characters in an e-mail address. Each time you create a new footer you will have to make two separate templates, one in HTML format (added to HTML and RTF messages) and the second in plain text (added to plain text messages). If you do not want to add footers to any of these formats, leave the appropriate template blank. You can use the built-in signature editor to create nice-looking footers containing HTML elements, images, etc. The personalized disclaimer (signature) can contain Active Directory placeholders, which will be dynamically replaced with appropriate data related to the specific user while the message is processed by the server. You can suppress footers for particular messages by placing a selected word or phrase in its subject or body. You define such key words and phrases in Advanced Options dialog box in Suppressing disclaimers section. 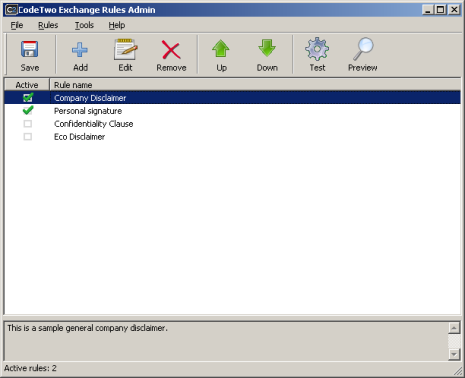 You can configure CodeTwo Exchange Rules 2003 to stop processing more rules when one rule has been applied or to continue applying more rules. This is done in Proceeding to next rules section in Advanced Options dialog box. To make sure that the created or edited rules are applied correctly, remember to save all changes upon exiting the rule wizard by clicking Save in the program’s main screen. The defined rules can be deactivated by unchecking the corresponding boxes next to the rules.